"What's this? 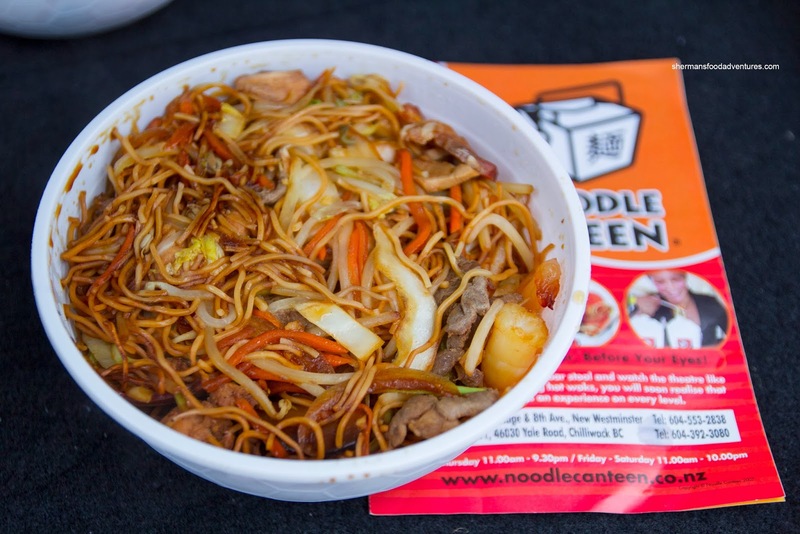 ", I queried after spotting a flyer for Noodle Canteen in my junk mail. Another fast food noodle joint in the same fashion as Noodle Box and Wok Box? As much as I am indifferent towards the 2 aforementioned spots, they will never be a priority to revisit. My issue isn't necessarily against the food as they don't really appeal to the authentic-seeking crowd anyways. The main reason I'm indifferent is that I can just go down to any Asian joint and get better for cheaper. But seeing that I want to try everything, I paid Noodle Canteen a visit anyways. 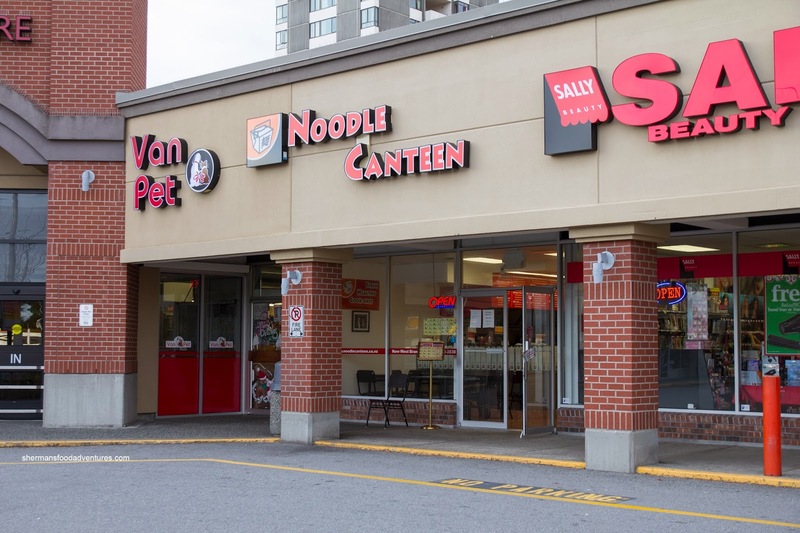 With 2 locations in the lower mainland, Noodle Canteen is a New Zealand chain of cooked-to-order fast Asian food. As I made my way into the place, I was startled by the fact that the staff were Chinese (they spoke mainland Chinese). Not that it really matters (because anyone can be trained to make any type of food), but it seemed to legitimize the place somewhat (strange but true). Currently, they have a special (for dinner only) where their Hot Box is only $6.20. Okay, before you get the wrong idea, the hot box doesn't involve smoking up in one's car. Rather, it is a fried egg noodle dish consisting of roast pork, chicken, beef and fresh veggies in a Thai chili sauce. I opted for pretty hot and it did have a nice kick. 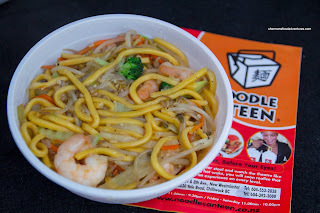 The still chewy noodles were the beneficiary of good wok heat where the flavours were caramelized. 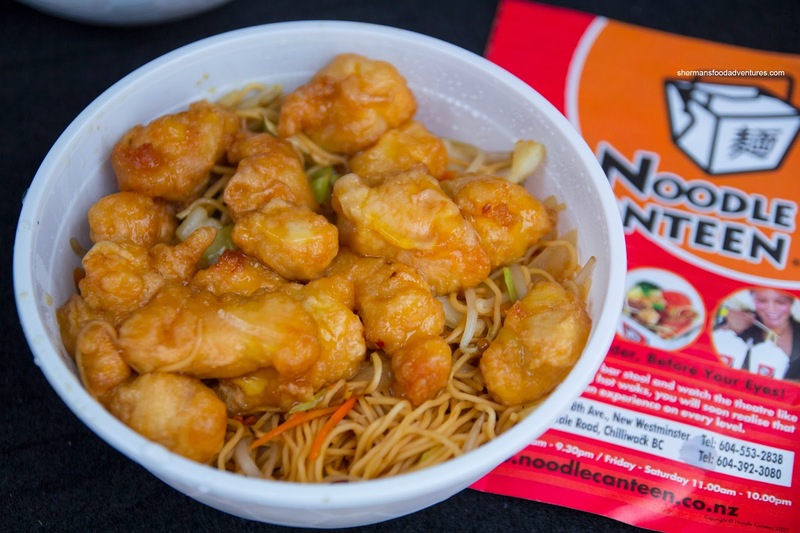 Their other special is the Honey Chicken Noodle ($6.00) with egg noodles and veggies. 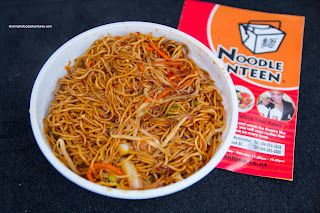 The noodles were pretty much the same without meat and spice. The battered chicken on top was moist but overly sweet in my opinion. With thick egg noodles, the Garlic Prawns was the mildest item we tried. It actually bordered on bland. On the other hand, the noodles were chewy and the large prawns had a nice snap. 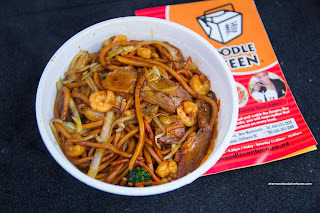 For the kiddies, I thought the Combination Noodles would be a good idea since it only consisted of egg noodles, prawn, beef, pork, chicken and veggies in oyster sauce. Once again, the dish was very similar to the first 2 yet without spice. I found the beef to be a little on the drier side though while the BBQ pork was pretty good. Probably the best noodles of the bunch was the Hokkien Mee made with thick egg noodles, roast pork, shrimp, bean shoots, onion, bak choy and spring onion in dark soy and mild chili sauce. 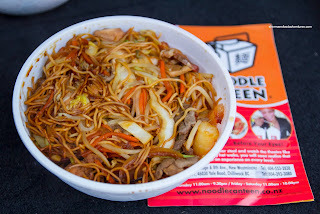 Again with good wok heat, the flavours were intense (savoury and some sweet) with a touch of spice. With a bevy of ingredients including the same meaty BBQ pork, snappy shrimp and crunchy veggies, it was full of textures and flavours. As you can see, the thing that sets Noodle Canteen apart is that the food most resembles Asian food (in a no-nonsense and unsexy manner). It may not be great food, but decent for a quick meal.